Today is my son’s birthday! 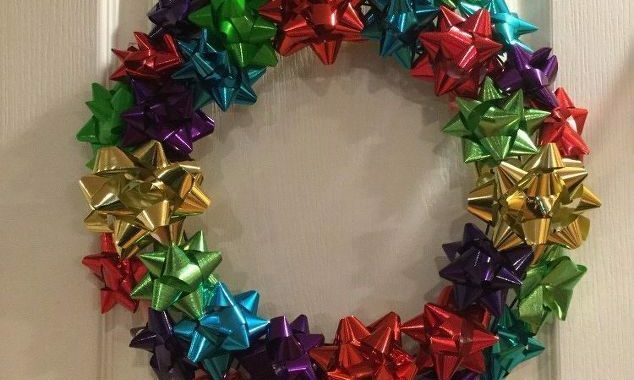 Grab some holiday bows and a wreath form and you can make inexpensive and easy wreath to use for holidays, birthdays, and several other occasions! 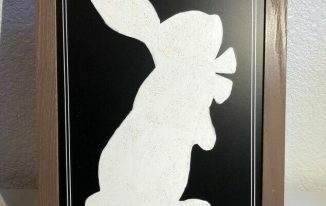 and place on the wreath form. Continue to add layers of bows all the way around the form. 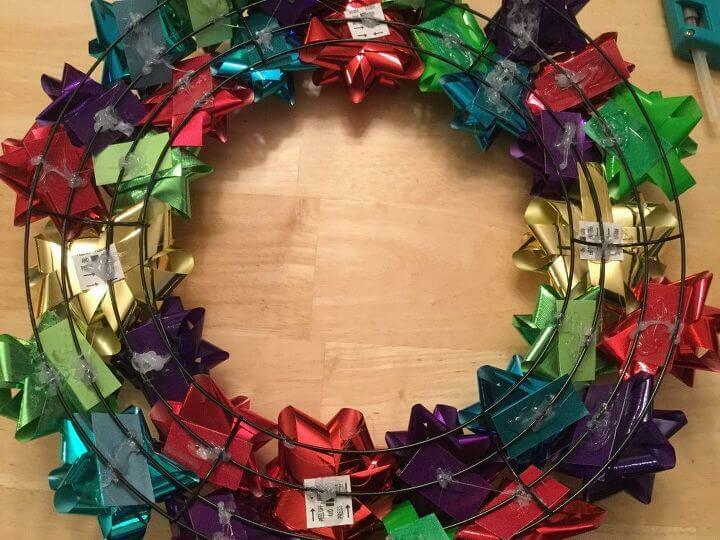 Once the bows are on, you can flip the wreath over and add a little extra glue for security on the back side if desired. You can decide whether you want to use a variety of colors or a specific few. 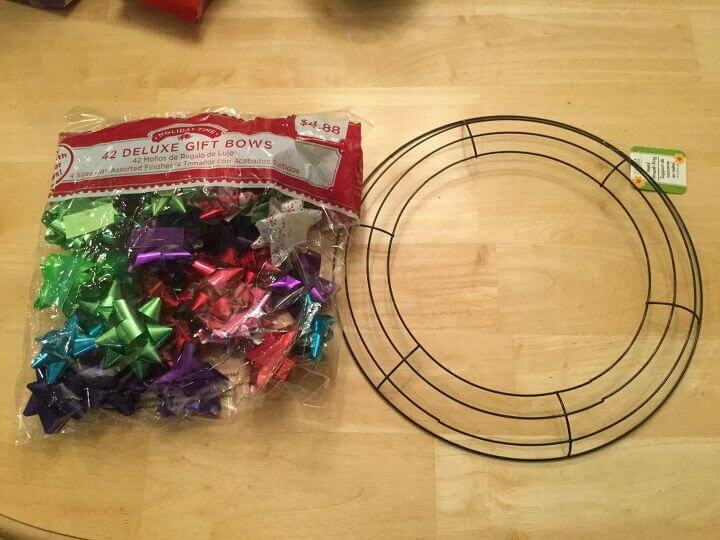 Hang the bow wreath and you’re done. 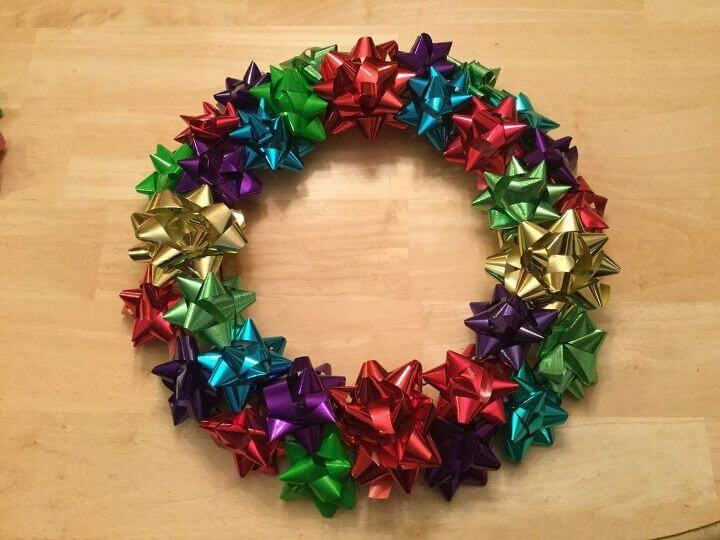 Such an easy and cute wreath. Happy Birthday Collin! Thank you so much Linda, I love how it turned out and how festive it is. I’m planning on using it for everyone’s birthday months to celebrate. Thanks Gail and that is a great question. You’re system is a good one and you can use hangers as well to hang them on the racks. I set mine flat in a bag to keep it dust free, on the seasonal box it goes with or if it fits inside I’ll put it on top inside the box. This wreath is really pretty! 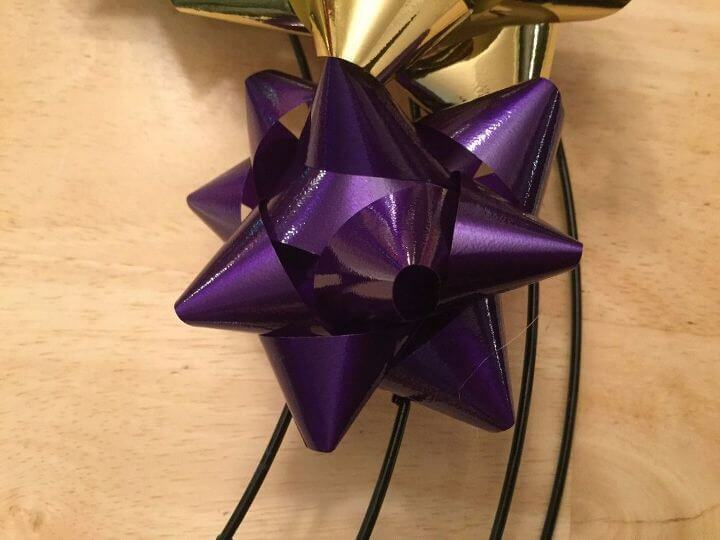 I’ve slowly used up all those type of bows but this is a cuter way to use them than on a gift box! Visiting from Talk of the Town. 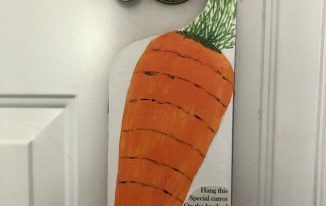 Thank you so much Victoria, I too am trying to reduce my items that just get tossed and this was one way to use them that I could use for all our family birthdays and celebrations. Your wreath made me think that it would be cute idea to make a wreath instead of the crazy hats, even though they are adorable, at baby and wedding showers! 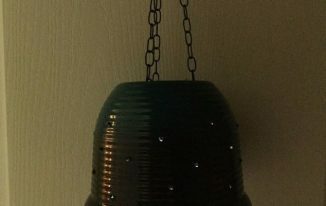 Thanks Catherine, and what a fun twist and idea… love hearing people’s spins on things. Thanks for sharing. Thank you so much and I’m thrilled you like this one. I only started making wreaths myself a couple years ago and have a few on here if you search wreaths in the search box. 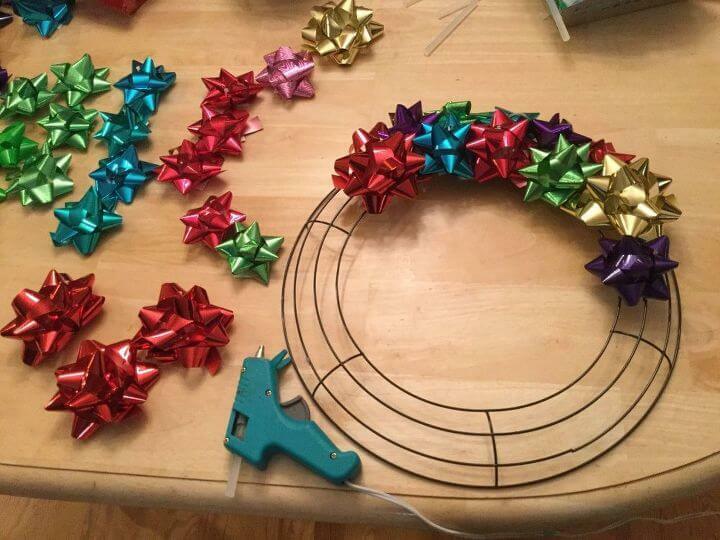 Maybe you’ll find some more that will inspire you, love that you want to step up your wreath game. 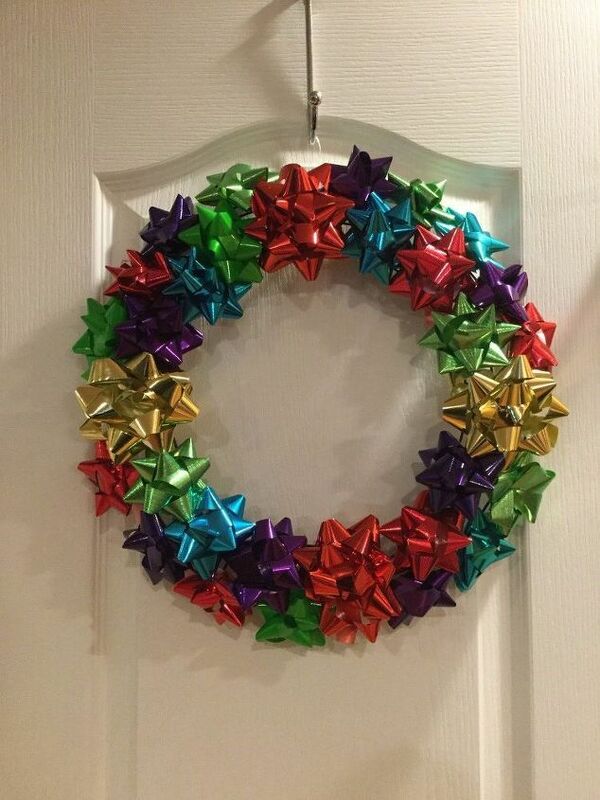 This is such a fun and creative wreath. 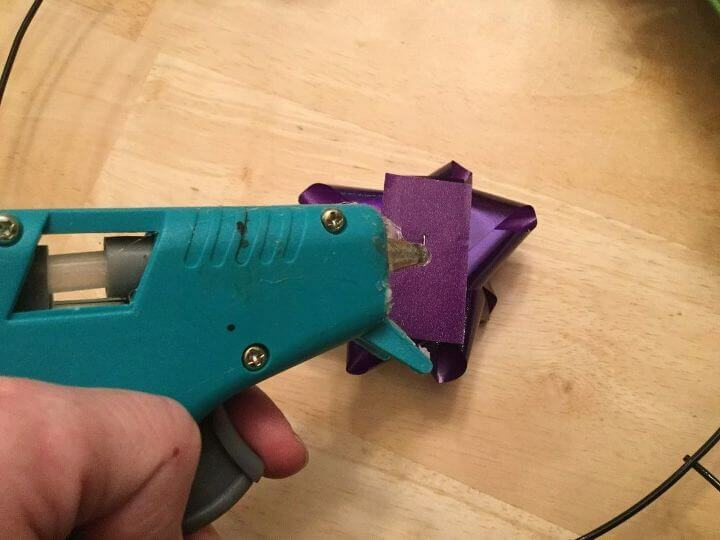 Pinned it for next Christmas. Visiting from the Happiness is Homemade Link Party.